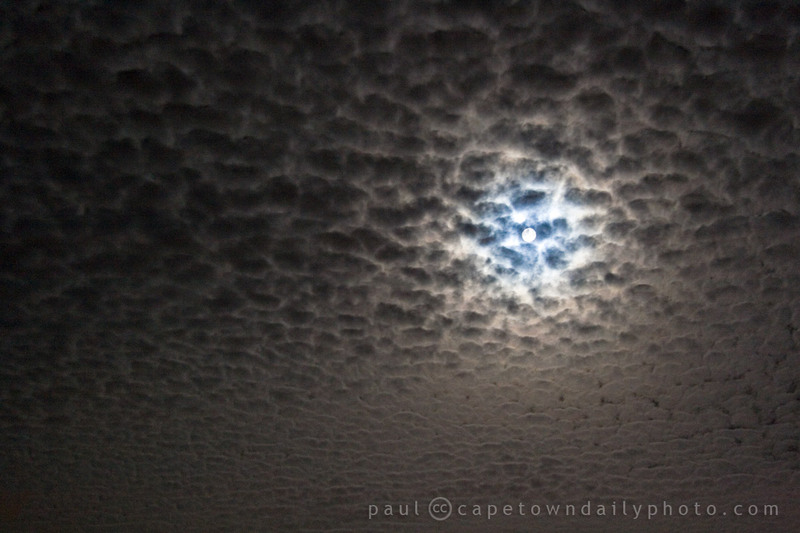 Hi Pamela – I took this photo at about 11h30, perhaps your daughter saw the moon later, after 12h00. From our vantage, at about 12h15, it looked as though a fire had started on Signal Hill or Lion’s Head. We deduced this not because of flames, but because of the orange in the sky and and smell of smoke. Perhaps this caused the moon to look orange? Happy New Year Paul and Kerry-Ann, from looking at the latest posts you’ve been having some fun time with the concerts down at the V&A..
Our New Years Eve was spent with friends and yes lots of good food and far too much to drink so today has been spent quietly recovering!! Well at last we can say see you this year and soon! Beverley, yes, indeed we have! Thanks for the wishes, and yes, awesome, we’re looking forward to seeing you guys again. P.S. that is a fantastic photo…..missing Cape Town. Really nice shot! Love the clouds making the whole image work like that. I saw this too but was just enjoying the moment and was still stoked about the result of my own photo taken earlier in the evening when I got the moon in partial eclipse as a passenger jet flew past coming in to land in Cape Town (you can google it as ‘blue moon reuters mark wessels’ or ‘blue moon reuters cape town’ or find it on yahoo news photo’s under ‘blue moon’ or on daylife.com in the photo section). Your photo provokes thought nicely and again teaches us to learn to use what we’ve got, in this case the clouds. Instead of being frustrated by them not giving us a clear view you turned it around and made it a work of art. Well done. Again really very nice indeed. Best wishes for the new year. Regards, Mark. Mark, thanks, and great photo! Did you see the aircraft approaching and wait, or was it just chance that you were focused on the moon at the time the plane crossed? Thank you for your Blue Moon shot, I could not see it for cloud in my part of the UK. I am looking forward to your beautiful views and news of CT in 2010, best wishes. Hi Paul. Thanks. I did see it approaching and waited for it to pass but it actually happened by chance. The small, seemingly insignificant sequence of events that led to it being taken made it happen. I love shooting the moon you see. For some unknown reason I’m eternally attracted to it and love it in all its phases but especially when it’s full. This was to be a ‘blue moon’ for me. I was perplexed at first coz of the overcast conditions and thought that I might not get to see it. We had just left home to go to friends for New Year’s Eve and I saw it rising through some palm trees as we turned onto Koeberg road near my home. We stopped in a hurry and I fitted an old 300 lens and started shooting like crazy. To say the least I was excited. I spent some time in the howling wind trying to get one decent shot. After a while I was relatively satisfied that I at least had something for me. Got in the car and drove further down the road and remarked that if I had waited longer I could have possibly got a plane flying past. As I said that I noticed a plane coming in. I of course freaked out as I watched the plane fly right past the moon. I looked for a place to stop and did so at a bus stop down the road. Grabbed my camera, jumped out and cursed my damn impatience. I was still marching up and down at the bus stop upset with myself for missing the moment when I saw a light. I looked and saw that another plane was approaching. What are the chances? I thought it was coming into land at Ysterplaat and in that case would not go past the moon. Then it turned. It was going to pass. Great. I hunched down as much out of the wind as possible and put the camera on some brickwork. The bus stop stank of urine. The smell was overwhelming. I didn’t want to move though. I checked my exposure and waited. I saw it was going to cross and started squeezing the shutter button frantically hoping I’d get something decent. I think I did. I was so chuffed I was marching up and down laughing and shouting hysterically for getting the lucky moment this time. A guy walked past and laughed at this crazy sight. I climbed into the car and giggled all the way to the braai. It was only later that I discovered that I’d taken it as the partial lunar eclipse started. I hadn’t even known about this. We didn’t see another plane for more than an hour. It was a happy new year’s present just for me. Now I get to share it… Enjoy. Regards, Mark. I know exactly how you feel. I’ve been shooting at music concerts before and then decide to move to a different position – and just as I’ve done so the most awesome photo opportunity presents itself – JUST WHERE I HAD BEEN. lol. Congrats again with that shot – it’s a beauty! Stunning shot Paul. Love this and Mark’s shot of the plane in front of the moon as well. Well done. Thanks Hendrik. I like the photo too (even though there’s nothing technically brilliant about it), and I have to agree that Mark’s one is pretty awesome. Ah, but see, if there is one thing I’ve learnt in the last year : It is that if you can evoke emotion with a photo it does not matter if it is technically correct. There is much to be said for technical merit, but if the photo doesn’t grab you then it can be technically perfect until it’s blue in the face. Hope things are going well in Durbanville world. Hendrik, I have to concede – it’s a good lesson. And, Lucky for me. Plenty of what I shoot isn’t technically correct… but, I’m really okay with that, and your comment and the other comments above, I guess, is evidence that I should be.